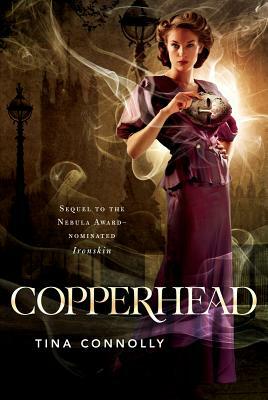 Set in an alternate version of early 1900s England, Copperhead is the sequel to Tina Connolly's stunning historical fantasy debut. Helen Huntingdon is beautiful—so beautiful she has to wear an iron mask. Six months ago her sister Jane uncovered a fey plot to take over the city. Too late for Helen, who opted for fey beauty in her face—and now has to cover her face with iron so she won't be taken over, her personality erased by the bodiless fey. Not that Helen would mind that some days. Stuck in a marriage with the wealthy and controlling Alistair, she lives at the edges of her life, secretly helping Jane remove the dangerous fey beauty from the wealthy society women who paid for it. But when the chancy procedure turns deadly, Jane goes missing—and is implicated in a murder. Meanwhile, Alistair's influential clique Copperhead—whose emblem is the poisonous copperhead hydra—is out to restore humans to their "rightful" place, even to the point of destroying the dwarvven who have always been allies. Helen is determined to find her missing sister, as well as continue the good fight against the fey. But when that pits her against her own husband—and when she meets an enigmatic young revolutionary—she's pushed to discover how far she'll bend society's rules to do what's right. It may be more than her beauty at stake. It may be her honor...and her heart. TINA CONNOLLY lives with her family in Portland, Oregon, in a house that came with a dragon in the basement and blackberry vines in the attic. She is the author of the Ironskin series (Ironskin, Copperhead, Silverblind) and her stories have appeared all over, including in Strange Horizons, Lightspeed, and Beneath Ceaseless Skies.